La Femme: let them eat cake! The April issue of Paris Vogue has a behind-the-scenes glimpse of Sofia Coppola's highly stylized Marie Antoinette (the trailer can be viewed here). 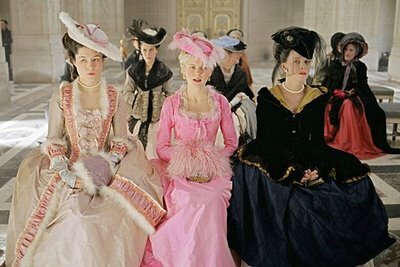 I'm slightly obsessed with historical costumes, so the abundance of corsets and panniers is drawing me like Carrie to Manolos. See the rest of the French article here. Posted by la femme at 11:51 p.m.